So you want to learn how to RE all the crud you pull off dead bodies do you? Well, before you get started there are some things you need to know. There are two basic types of loot needed to begin your career as a Reverse Engineer; Stat items and junk. Stat items are clothes, armor, and jewelry which are looted off NPCs and on rare occasions animals. Junk loot are looted from a wide variety of NPCs. Not everything looted can be used in your RE. 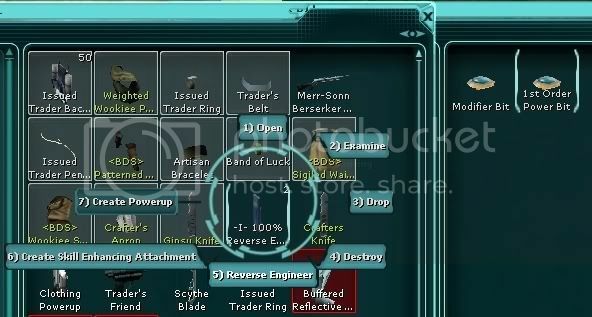 All trader classes can make this tool, it is relatively simple and as easy as crafting tools to create perfect tools. Reverse Engineering tools are from a 0 to a 10.0 rating. This is absolutely vital to the reverse engineer project. I have not been able to test how much a difference a +1 tool has compared to a +10 tool, though I imagine that a +10 tool offers some sort of bonus. There is an expertise option available 'Deconstruction Techniques' that offer a 5-10 point bonus. This is vital if you want to use the re-reverse engineering mentioned later in this guide. Also there is an expertise option to create multi-stated attachments. Without this expertise you are limited to making single stat items. You can make an attachment or powerup regardless of level, as long as you are a trader (any except Structures). The power and strength of the attachment/powerup is directly related to the powerbit and modifier bit, not the skill of the person creating it. Reverse Engineering chance (Which increases at certain levels) does effect the strength of powerbits when they are created. 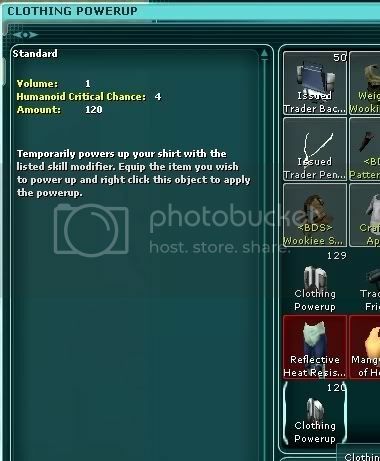 So a low level character CAN reverse engineer loot clothing into powerbits, but the strength of the powerbit will be less then if a high level trader had Re'd the item. OK with the basics out of the way time to get into the process of creating your attachments and powerups! To make and attachment you need two things; a powerbit and a modifier bit. Powerbit: This will effect the strength of your attachment. A powerbit is created using loot stat items. 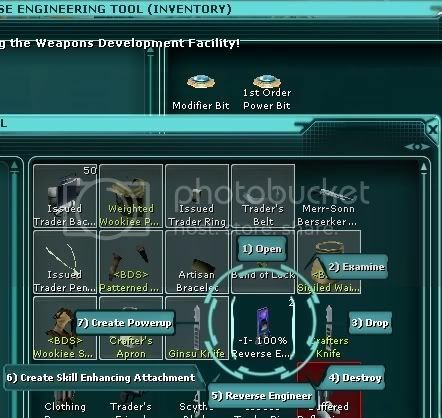 How this is created is to place your loot item into your reverse engineering tool and using the radial menu select 'Reverse Engineer'. After this is done a 'Power bit' will be created in your top-level inventory and the loot item will be destroyed. There is a random chance that the strength of the powerbit will be different then the power of the loot item RE'ed. Read the second post on how to maximize your bonuses and chances on make more powerful powerbits! Modifier Bit: has made fantastic progress on the combinations needed, including MANY of the rare ones. 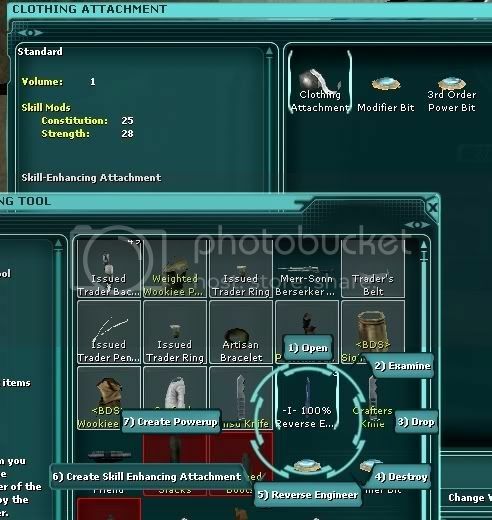 To create your modifier bit you need two differing types of junk loot. For example to make a '2-handed melee action cost' modifier bit one combination is a 'Medical Device' and a 'Power Output Analyzer'. 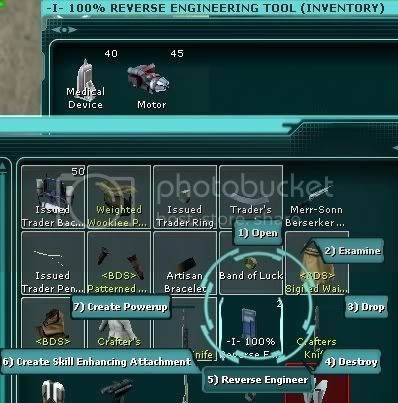 Once you have placed both items into the Reverse Engineer Tool use the radial menu again, selecting 'Reverse Engineer'. 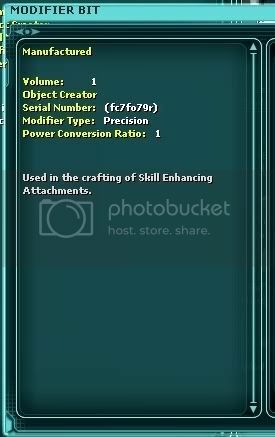 A modifier bit will be created in your top-level inventory. The junk loot in the tool will decrease by one each (Since junk loot stacks). To make a new modifier bit you will need to remove the junk loot from the tool and replace them, or merely reverse engineer again if you wanted to make more then one modifier bit. Exotic Mods: These are simply any modifier that is not Strength, Precision, Constitution, Stamina, Agility, Luck, Camo, and Block Value. Now that you have your modifier bit and your powerbit it is time to create your attachment. Place your powerbit and modifier bit into your reverse engineering tool and use the radial menu to select 'Create Skill Enhancing Attachment'. When that has been selected the powerbit and modifier bit will be destroyed and an attachment will be created in your top-level inventory. 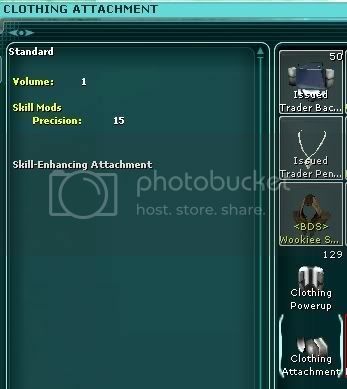 The type of attachment made is based on your level and skill modifier. Domestics create clothing attachments. Shirt attachments are made when exotic mods are used. Engineers create Weapon Attachments regardless of what it modifies. Munitions create armor attachments. Breastplate attachments are created when exotic mods are used. The power of the attachment is based on what it modifies and the strength of the powerbit used. Each Modifier bit contains an attribute called "Conversion Ratio". This number is used to divide the strength of the powerbit. For example a 'Healing Potency' modifier has a Conversion ratio of 8. What this means is the powerbit will be divided by 8 to come up with the attachment power, all fractions are lost. This means an 8 powerbit and a 12 powerbit will both create a 1 healing potency attachment, while a 16 will create a 2 healing potency attachment. This also means that there is a minimum strength of powerbit needed. A 7 powerbit will produce a +0 Healing Efficiency. Agility has a 1-conversion ratio, which means that the strength of the powerbit will be the strength of the attachment. 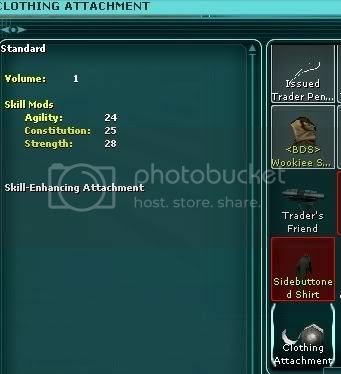 As well as being able to make skill enhancing attachments a trader can also create powers for specific items as well. Munitions create armor powerups, engineers create weapon powerups, and domestics create clothing powerups. You can only have one of each type of powerup active at a time, but can have a powerup active on all three items at the same time; shirt, weapon, or breastplate. Best news is they stack with each other and any stats currently on the article it is enhancing. A powerup lasts for 30 minutes of playtime, and you can make several uses of powerups from a single powerbit and modifier bit. Powerups are limited to single stats though, no combination STR/CON/STAM (Or anything else for that matter) powerups. I tried being creative and discovered that Experiment/Assembly powerups cannot be created. The process of creating your powerup is the same as creating your attachment, except you select 'Create Powerup' on the radial menu. The strength of the Powerup is based off your characters RE Chance skill. The strength of the power up can be over three times that of what you would expect from the same combination of powerbit and modifier bit on an attachment. I have so far found lots of uses for powerups, because they are strong, and from one modifier bit and powerbit you can get over 30 hours of game time before having to get another! The amount of uses you get from a powerup is dependent not only on your RE Chance skill, but also the strength of the Powerbit used. Congratulations on creating your one stat attachment! Read the second post for information on advanced Reverse Engineering! All right, now you are ready to create an attachment with 2 stats or even 3! To make a multi-stat attachment you need a single stat attachment, a modifier bit, and a 2nd or 3rd order powerbit. To start create your powerbit as described in the previous section. To make 2nd order powerbits you need to RE a 2 stat loot item. Also, 20% of the time, single stat loot items will convert to a 2nd order powerbit. 3rd order powerbits are created by reverse engineering 3 or 4 stat looted items. The power of the 2nd or 3rd order powerbit is created is based off the highest modifier in the looted item. The chances of making a third order powerbit from a 2 stat item is less then 5%. I have also not seen any 2-stat items become 1st order powerbits. You can also 'force' a 2nd order power bit by REing two single stat items into a powerbit. A 3rd order can be created by REing two double stat items together. Placing a single stat attachment in the Reverse Engineering tool along with a 2nd order powerbit and a modifier bit creates a 2 stat attachment. The strength of the new addition to the powerbit follows the same rules as when you created the attachment. Use the Radial menu to select 'Create Skill Enhancing Attachment' after all three items are within it. An attachment will appear in your top-level inventory that now has the second powerbit and modifier added to the original attachment. The power of the original modifier remains unchanged. To create a 3-stat attachment then you need a 2-stat attachment, 3rd order powerbit, and modifier bit. The creation for this follows the same rules for creating the 2-stat attachment. IMPORTANT NOTE: Once you make the attachment you can't add a exotic modifier to a standard. So the first mod (in a multiple mod attachment) you need to make needs to be the exotic mod to make your breastplate/shirt attachment, to which anything can be added. Interestingly enough Block Value is a non-exotic mod (can be placed on any item), but it has to be the first on on a multi-stat attachment, since it cannot be added to an attachment with one of the standard mods. 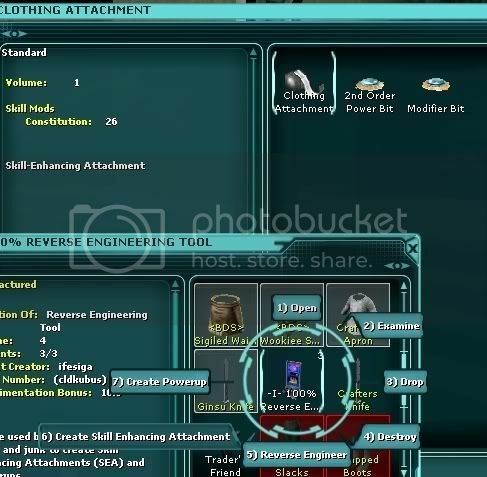 For example: You want to make a +8 Experiment, +3 RE Chance, and +35 luck Shirt attachment for your trader. If you use the Luck modifier with your 1st order attachment you will create a clothing attachment. If you attempt to RE a +32 2nd order, Experiment modifier bit, and the +35 Luck Clothing attachment it won't do anything. To make it you must start with the experiment or RE chance to make a shirt attachment. The strength of the final powerbit is directly proportional to the strength of the highest stat on the item being RE'd, Character level of the loot item, luck, and the Reverse Engineering skill. I have seen NO differences based on being in a Research Center, near a crafting station, or an Assembly bonus buff from an entertainer (Luck bonus from an Entertainer does apply). One of the goals of RE'ing is to get +30 or higher powerbits, there are a number of ways to attain this. When a looted item is first reverse engineered into a powerbit there is a random chance that the powerbit will be stronger then the bonuses to the looted item. There is also a small chance that you will get a WEAKER powerbit, though there is by far a greater chance that you will increase the strength. Armor and multi-stat items have better RE bonuses due to the fact that they have higher CLs then clothing or single stat items. RE chance seems to affect the strength of the RE, for example. I could only get +3 as a max bonus for my baseline (i.e. the stat item had a +17 stat and I got a +20 powerbit), but was able to get +4s with a minor attachment to my RE chance. The average didn't change much with the RE bonuses. Luck seems to affect the average bonus to your RE. You get higher average bonuses, but I have not notice it effecting the maximum value of the REs. Even when maximizing your RE chance,a theoretical RE skill of 149 (110 for level 90 plus Deconstruction Techniques for Expertise, plus another 36 (+3 attachment each on weapon, chestplate, and shirt; with an additional +10 powerup each on weapon, chestplate, and shirt), it is still a long process to make a +35 powerbit. This process I am calling "Multiple Reverse Engineering" or "Iteration" (per the main website). The simple version is to take a created attachment, usually of the base abilities, because they are easier to make modifier bits for and don't change the power of the attachment, applying them to an article of clothing/weapon/armor and then taking that item and Reverse Engineering it. For example: I make 1000 Casual Shoes (Small resource requirments), as a tailor, via factory run and have them named RE shoes. I take a few crates of them into my inventory then take out a few (usually 5-10 at a time), then use junk to make 5-10 Attribute modifier bits (I'll use strength for this example). I usually only iterate +25 or higher Powerbits, so I take my +25 powerbit with a Strength modifier bit, and attach it to a RE SHOE, to make a pair of shoes with +25 strength. I place it in the RE tool then activate all my buffs and powerups. I then Reverse Engineer the +25 Strength Shoes I have made and hopefully I get a +26 powerbit out of it. Lather, rinse, repeat until you get that +35 powerbit. This sounds simple but it does take a lot of time and a lot of crafted items and modifier bits. It can take 15-25 times to take a +25 bit and turn it into a +35 powerbit. This translates to 45-75 attempts to make a single triple stat +35 attachment. The limitation is due to the fact that crafted items have no CL and the bonus to the stat to powerbit process is related to CLs. This means that while RE'ing a looted +22 luck shirt can give you a +28 powerbit, RE'ing a crafted +22 shirt is likley to leave you with a +21 powerbit if your luck and RE chance skill is too low. Boosting my luck to 500's and with a 122 RE skill I was able to increase the strength of a multiple RE by one point every 10 or so REs, of course I also lost a point every 10 or so REs. Though I nearly always lost 1-2 points with an un-enhanced luck and RE skill. I would NOT recommend doing this unless your RE skill is at least 130s (Maxed out is obviously best) and have the ability to boost your luck above the 500 mark. Ideally you want you RE chance above 140 and you luck as close to 1000 as is possible. Strategies for boosting RE chance: The process of making RE chance modifier bits is excruciating. I spent 4 hours looting just to find enough pieces to make 2 modifier bits! The modifier has a 10-conversion ratio, so you need a +30 powerbit to max out your attachments and a +35 for your powerups (Not easy to get). Your best bet is to spend a lot of time looting off Dantari on Dantooine for Circuits and Differential Regulators for circuits you need medical consoles and to the Differential Regulators you add Used notebooks (Rather rare loots from Nyax and Rogue Corsec), that’s how you make your modifier bits. If you can only loot a couple then your best bet is to first make powerups since they have more power then attachments, but still have ALOT of uses before they are used up. 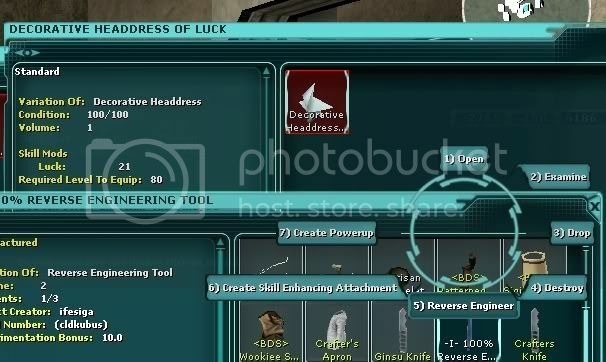 Boosting Luck: There are a number of items that can boost luck, which is 90 by default for a level 90 character. The most obvious is to make sure every thing you are wearing that can accept a luck attachment has one! You can easily boost your luck by 450 points (Human-esque with full clothing and armor lucked, at 25 power). There is also 150 points from an entertainer. Looted luck bonuses provide 60 points and food can provide another 50. There are a couple other stims that can boost luck. The Advanced Styptic stim created but the Chur-gon Dar cube can provide a 100 bonus. Right here you are looking at 900 luck! If you have way too much money to spend or your crafter was once a combat toon you can get the Shards of Retaliation that give another 200-point bonus! Reserved for Data and math information that probably won't matter to most people that are reading the thread, but will be useful and informative to those who like math and statistics, allowing them to doubt check my conclusions. My baseline data is taken from +17 single stat loot items. A fair mix of armor and clothing. I did not separate things by CL. I was using a +10.0 tool, without any bonus to luck (using the base 90 luck that all level 90 characters have), RE chance (Other then what is provided by expertise), bonuses to assembly or experimentation, or inside a research center. When I gather the data nessisary I will add that data to this pool to justify my conclusions. ALSO: PM ME OR POST ABOUT THINGS I AM LEAVING OUT THAT YOU MAY WANT TO KNOW!